The collaborative research project between academics in the School of Mathematics, Computer Science and Engineering and the School of Health Sciences enables users with aphasia to practice their speech and establish social connections. 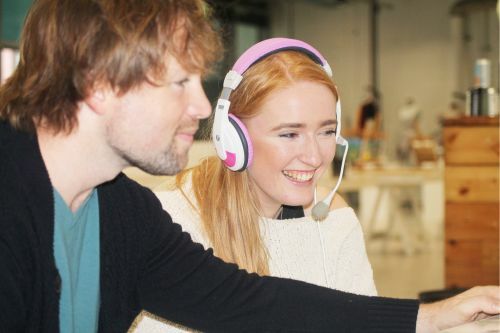 EVA Park, a virtual world developed at City, University of London for people with aphasia was featured on 5th October at this year’s Discover Thought Fest, a week-long festival of experiences exploring sustainability, wellbeing technology and the future. Eva Park is a multi-user virtual world for people with aphasia, a language disorder typically caused by stroke. The collaborative research project between academics in the School of Mathematics, Computer Science and Engineering and the School of Health Sciences, enables users to practice their speech and establish social connections. It was created by the EVA Project, funded by the Stroke Association, which has for the last few years investigated the accessibility and usability of the virtual world, and explored the impact of therapy delivered in EVA Park on communication and feelings of social isolation. 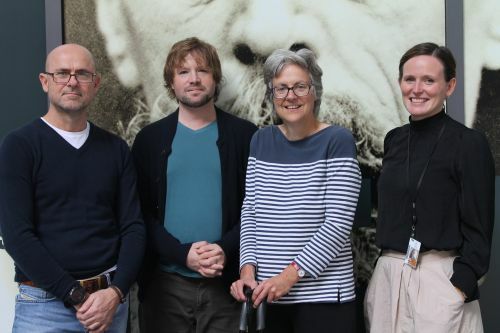 Professor Jane Marshall of the Division of Language and Communication Science in the School of Health Sciences, was on hand at Regent’s Place in North West London, to guide visitors through EVA Park’s genesis and how it has assisted people with aphasia. The Discover Thought Fest event was held in association with London’s Knowledge Quarter, a knowledge cluster located around King’s Cross, the Euston Road and Bloomsbury. The partners of the Knowledge Quarter include The British Library, The British Museum, Google,The Alan Turing Institute, Francis Crick Institute, SpringerNature/Holtzbrinck, The Wellcome Trust, The Guardian, Paul Hamlyn Foundation, Royal College of Physicians, SOAS, University of London and Working Men's College among others. City is committed to contributing fully to the development of the Knowledge Quarter, and partners within. It is clear that City’s strengths in AI, Big Data analysis, health sciences, engineering and the Arts and Social Sciences all have a major role to play in the development of the region, and City intends to maximise its influence as the Knowledge Quarter develops. We believe it is of utmost importance that City's excellent research and student capabilities make an immediate and ongoing contribution to not only the Knowledge Quarter's assets, but to the UK’s overall emerging industrial strategy. In 2016, Eva Park was selected for the 2016 Nominet Trust 100 – a global celebration of that year’s 100 most inspiring social innovations using digital technology to drive social change around the world. Eva Park also won the 2015 Tech4Good People’s Award.